A Micromax sub-brand “YU” today launched its flagship smartphone called the Yutopia. According to YU, it is the ‘most powerful phone on the planet’, is priced at Rs 24,999. Yu Yutopia goes on sale on December 26 exclusively via Amazon India, and pre-bookings start at 2:00PM today. As per the design, Yu Yutopia offers a full-metal body made using aircraft-grade aluminum. Yu Yutopia is only 7.2mm thick, and the company also claims that the antenna bands are 40 percent thinner than what you find on the Apple iPhone 6s. Yu Yutopia also meets the security requirement, as it has a fingerprint sensor placed at the back. The scanner can also be used to click selfies, apart from waking up the smartphone. Yu Yutopia flaunts a 5.2-inch WQHD (2560×1440 pixels) IPS display with 565ppi and Corning Concore Glass protection. Under the hood is Qualcomm’s 2GHz Snapdragon 810 64-bit octa-core processor paired Adreno 430 GPU and 4GB of LPDDR4 RAM. Also a 32GB internal storage, which can be expanded using a microSD card. As far as camera is concerned, the smartphone is equipped with a 21-megapixel rear camera with LED flash, Phase Detection Autofocus (PDAF) with focusing in 0.2 seconds, Optical Image Stabilization (OIS), and HDR. The camera is also capable of recording 4K videos at 30fps and slow motion videos at 120 fps. Whereas there is an 8-megapixel f/2.2 wide-angle selfie camera. The handset also features a 3,000mAh battery, which the company claims is good enough to last an entire day. It also comes with Quick Charge 2.0 support, which can charge the battery from 0-60 percent in only 30 minutes. Connectivity options include 4G LTE support, Wi-Fi, and Bluetooth. On the software front, it runs on Cyanogen 12.1 OS based on Android 5.1 Lollipop out of the box. At this price point Yu Yutopia directly, competes with OnePlus 2. Apart from Yutopia, YU also announced a new service called ‘Around YU’. This is essentially a hub that has different services rolled into it. In essence people looking for food will get options from the likes of Zomato, shopping deals from Scandid, travel deals from Ixigo, and cab options from the likes of Ola, Taxifor Sure, among others. 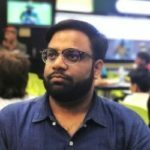 As an introductory offer, Around YU users will get up to Rs 100 off on the first cab ride, 15 percent discount on the food ordered via the service, and 500 users will get a ticket at only Re 1. 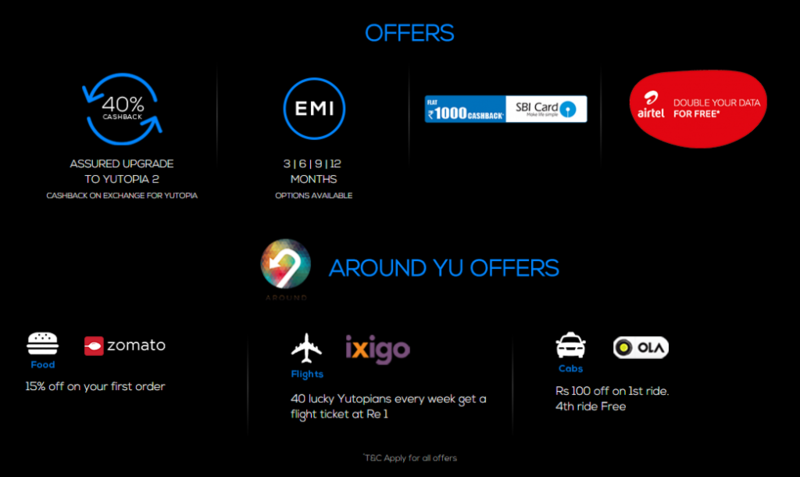 When the Yutopia goes on sale next week, YU will also be offering a bunch of deals along with the likes of Airtel and SBI. Airtel 4G users will be entitled to double data offer, while SBI credit card holders will get Rs 1,000 cash back. There is also an ‘Assured Upgrade’ program, which is on the similar lines of what Apple unveiled along with the launch of the iPhone 6s and iPhone 6s Plus. Yutopia buyers will get an assured upgrade to Yutopia 2 when it is launched, and up to 40 percent cashback on the value of the Yutopia. Design Full-metal body made using aircraft-grade aluminum Outer frame is crafted from a resilient alloy of aluminum and magnesium.